Boredom and monotony. Unceasing repetition. The mind is sedated, lulled to sleep among the endless waves. No hope. No relief. Is this what it was like to be a Danish chieftain in the Dark Ages? The Spanish development studio Sunburned Games seems to think so. 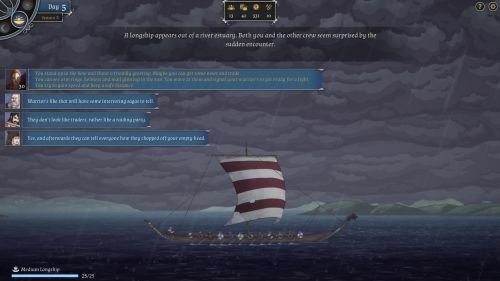 Their first game "The Great Whale Road" has just been released into Early Access, and it's one of the most boring RPGs in recent memory. In its present state, the game lacks any sense of challenge, any sense of urgency, and any sense of entertainment. When I had finished playing through the press build, I felt like I had lost several hours of my life that I would never be able to get back. Then I looked at the clock and realized that the entire playthrough had only taken me 90 minutes. What's gone wrong? 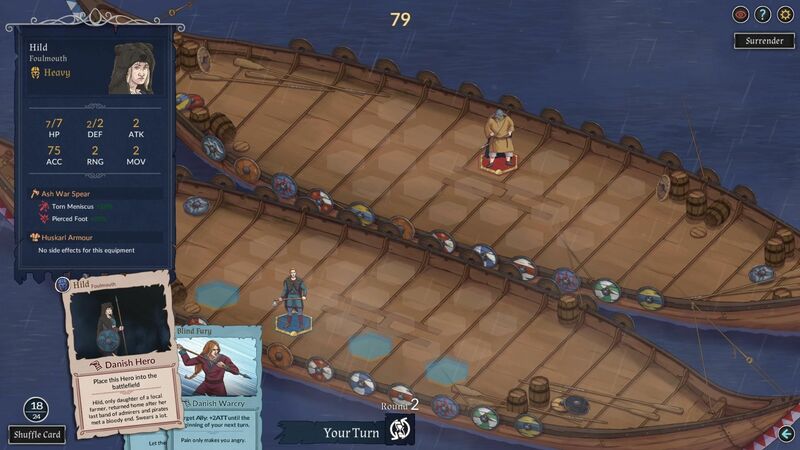 On paper, The Great Whale Road seems like a perfectly interesting little game; it's basically a cross of The Banner Saga and King of Dragon Pass, staged in the historical setting of the North Sea around the year 650 AD. You play the newly selected leader (male or female) of a small Danish settlement; storylines for the Picts, Franks, and Northumbrians are promised to follow later in development. 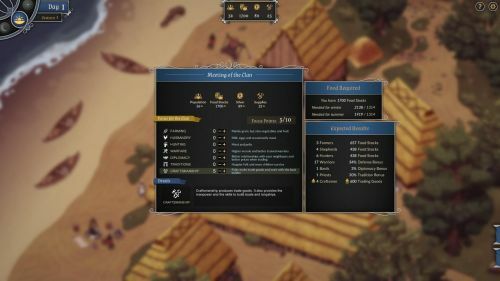 As the chieftain, you have to manage the economy of your settlement while simultaneously playing through a linear storyline of political frictions and intrigue. 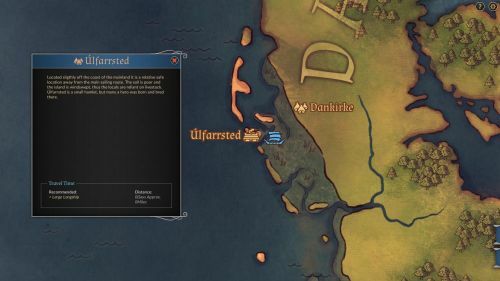 You have to decide how to distribute your people's manpower between diplomacy, trade, warfare, or any of the various ways of gaining food; you need to deal with a variety of random events, from pirates to the plague; and you have to lead your warband into turn based battles against your people's enemies. During the winter months, you rest at home; during the summer months, you set sail to trade and parley with your neighbours. Sounds good, right? And yet, in the current state of the game, none of these elements are actually fun. 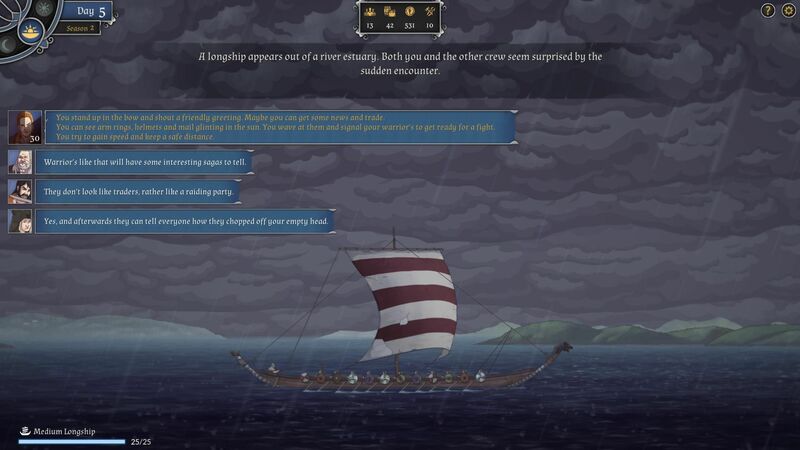 The storyline is probably the game's most interesting feature right now, but this “story experience” amounts to little more than “read text, automatically set course for location A, start staring at your ship while it moves along the shore, wait, wait, wait, read more text, insta-return home, read a bit more text, wait until the next summer, automatically set course for B, start staring at your ship, wait, wait, wait, wait, wait, wait, wait, read a bit more text, have a short battle, and instantly return home again.” The press copy only covers the first three years of the Danish storyline, but even these early parts of the story feel too decompressed, too rigid, and too linear to be enjoyable on their own. And for all the talk about the complexity and appeal of the game's historical setting, the only interesting thing I did in the press copy was to sacrifice a dog to Wotan. That's a perfectly good start, but the game needs to offer a lot more events like this one; a setting that's nearly 1,400 years removed from our time should feel alien and uncomfortable, not sleepy and mundane. I believe the game could be tremendously improved by offering more detail, more nuance, and more background information. The lack of detail and nuance also serves to make your ship journeys feel like shameless filler. For example, the locations “A” and “B” from the above example are quite close to each other in the game, so the journey to “B” leads you along the same route you took to “A”, right past the same sleepy coastal villages you already visited a year earlier. If there were supposed to be any changes or newsworthy events in those villages during that time… well, they haven't been implemented yet. These may just be unfortunate missteps of storytelling that will be corrected in the future, but right now they only serve to compound my feelings of tedious repetition. Another part of the problem is the lack of dialogues in the game, especially among the party; you spend about 80% of your playtime and many years of your in-game life sitting on your ship, supposedly surrounded by friends and acquaintances from your home village, but there's nobody to simply have a chat with. All you can do is wait, and wait, and wait, staring at an image of your ship bobbing on the Nordic sea, until you finally arrive at your target destination and get a morsel of story thrown your way. These long waits in between story events are supposed to be filled by gameplay events; sadly, the gameplay in the current version is too simple and superficial to provide any lasting appeal. For starters, there are far too few events in the game right now; they already start repeating after 15 or 20 minutes of play time. Your crew will find rats in the hold, each of your companions will offer you a line of advice, then you'll decide to lay out rat poison, then all the rats are wiped out, then someone will find more rats, your companions will give you the same advice again, then you'll lay out more rat poison, then all the rats are wiped out, and so on and so on and so on. Most of the outcomes don't seem to be influenced by character stats or the RNG either; when I chose to poison the rats for the third and the fourth time, I could predict exactly what was going to happen. Even if you stumble into a “bad” outcome, it'll be easily fixed by resting, spending a night at a tavern, or using a plentiful consumable; none of the consequences I encountered could ever be described as “serious” or “disruptive”. Thankfully, all of these problems are fixable; the devs merely need to put in more events, write different outcomes, and provide more connections between the events and the overarching plot. This will be a fair bit of work, but it should also be perfectly possible to implement this kind of content during the Early Access phase. The town management system has the same issues: within the 3 year frame provided by the press copy, I couldn't make a single decision that had a real, gameplay affecting impact on my settlement. I could deliberately allow the plague to spread to my village and allow all my shepherds to die, but I still had a food surplus and none of the other characters seemed to have any sort of problem with my actions. There was no sense of impact to my decisions; they were just another chore that had to be taken care of. If I'm supposed to take this system seriously, it must be invested with much more detail and depth; it needs to make me feel like my decisions as leader genuinely affect the future of my people. We should also take a close look at the combat system, which is unfortunately quite dull in its present state. The basic idea is that battles are “leader vs. leader”. It's just your PC and the enemy dude standing at opposite ends of a hex-based battlefield, and then each of you starts shuffling playing cards to put the rest of your companions (up to three) on the field. Then you send your group towards the enemy; whoever kills the enemy leader first wins the battle. Each character can move a few hexes and then either “attack” or “defend”; defending raises a character's defensive value (! ), while attacking usually allows you to choose from two different types of attack (slash vs. stab, for instance) before rolling a to-hit die. Special attacks are supposed to be implemented later during development. There's a lot to dislike about this system. First of all – why are your companions placed on the field by drawing cards from a deck? They're supposed to be real people, with personalities, equipment, and stats and all that, so why can't they just join the battle from the start like their leader does? 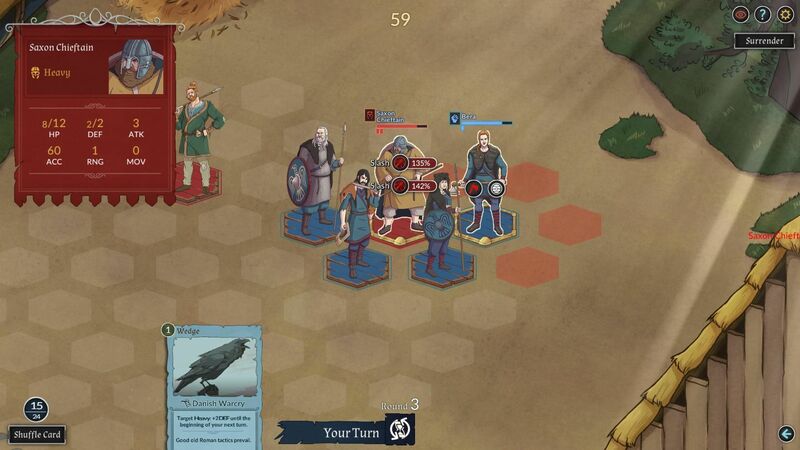 The mechanic doesn't even have any gameplay value right now; you travel with a group of three companions, and you can place all three of them on the battlefield before you need to engage the enemy, so the cards don't offer any strategic choice at all. In practice, you'll just keep shuffling cards and skipping your turn until you pull out your companions, then you place them on your side of the battlefield, and then you can start fighting. The designers could just as well put the full group on the field from the start and save everybody some valuable leisure time. Actually, the whole playing card mechanic is simply very lame in its current implementation; with the exception of the three companion cards, all the cards gives bonuses like “+2 Attack for 1 round, can only be played after round 7” or “+4 Defense to a defensive hero for 1 round, can only be played after round 5”. Not only are these bonuses boring as hell, but they encourage defensive play; you just keep shuffling through your deck until you get all companions onto the field, then you keep shuffling until you get the best cards, then you skip your turns until you can play the cards or until the enemy has walked over to you, and then you start smacking the enemy leader while keeping your leader as safe as possible. You can have up to three cards in your hand at the same time, and you can freely shuffle any of them back into your deck and draw new cards after each turn. So you just shuffle, and shuffle, and shuffle for a few turns until you get the cards you want, then you engage the enemy leader, kill him within one or two turns, and then you're done. The enemy AI is also quite awful right now, walking into vulnerable positions when it should be running away, failing to assume a formation, putting their leader in front instead of keeping him way at the back, going after one of your fighters instead of your chieftain, attacking when it should be defending, defending when it should be attacking, etc. etc. Like almost everything else about TGWR, the AI is going to require a ton of work before release. And to be honest, I'm not even sure if a good AI on its own would make the game any better. The current focus on defensive protect-the-leader gameplay means that the best strategy is just to turtle up and keep shuffling cards; if the AI actually did that, it would just make the battles even longer and even more monotonous. I would much rather see a far-ranging shift towards aggressive gameplay, with ranged units [update: ranged units have been implemented in the Early Access release patch], more powerful cards, cards that have to be played before a certain turn instead of afterwards, and a good selection of encounters that aren't simply “protect your leader, kill enemy leader”. If your own leader falls, the battle is lost, the character needs to rest back to full health, and you miss out on a potential reward. If all of your characters become badly injured, you insta-return home and advance to the winter season. By the next summer you'll be fully healed up again and ready to continue the storyline. Despite deliberately losing a few battles, I've never managed to see a game over screen; it may not even be possible to lose in the current version. 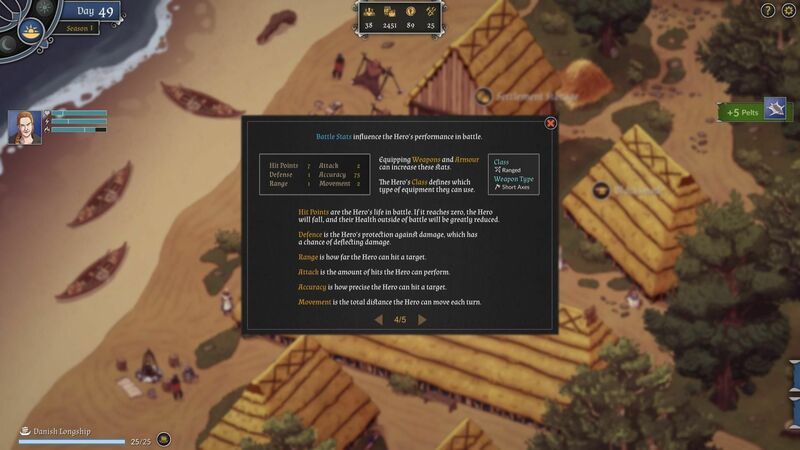 Should you go play The Great Whale Road right now? Absolutely not, you'd be bored stiff! But should you buy it right now? Well, perhaps. The game is coming off a failed Kickstarter, and the Early Access income would probably be helpful to Sunburned Games in their efforts to deliver a complete and hopefully entertaining experience. If the idea of a Banner Saga/KoDP hybrid with lots of stats and random events is inherently appealing to you, and you have money to spare for a game that so far delivers nothing except some pretty 2D screens and a half-complete campaign full of shallow and repetitive gameplay, then you might as well throw some funding at this project. Support your indie developers! Just keep in mind that none of the promised features are actually guaranteed to ever make it into the game. The Great Whale Road is currently available on Steam Early Access.